BEFORE: Today brings another film and the end to another month in this movie marathon. 12 Monkeys has the honor of closing out the third month of movie watching. As is my tradition, the end of the month means it’s time for statistics which you may or may not care about, but which I find extremely interesting. September brought an additional 3,120 minutes or 52 hours of movie goodness and 13,597 words of ranting. Overall totals now update to 10,694 minutes or almost 7.5 days worth of film and 38,577 words. Average ratings continue to dip, this time from 3.58 to 3.54. The experience continues to be rewarding and eye-opening in many ways. Not only am I accomplishing my main goal, watching classic movies that people wonder, “You’ve never seen THAT movie!? !” but I’m also learning more about criticism. Looking back on my first reviews I feel I have come a long way and that I’m still changing the way I write. I appreciate all the feedback and support I’ve gotten these past three months and I would like to thank everyone who has read just one or even a whole bunch. It means a lot that you take the time to read my thoughts and opinions and I hope you continue to do so. Now for another time travel film. AFTER: 12 Monkeys is actually more similar to Looper than I was expecting and it’s not because Bruce Willis is in both films. Yes, both are time travel films, but both also deal with a dystopian future albeit to varying degrees. 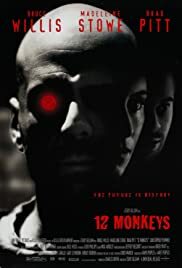 12 Monkeys takes a much more apocalyptic look at the future and even the past as James Cole (Bruce Willis) attempts to track down the origins of a deadly virus that kills over five billion people. One of the biggest strengths of this film is the acting. Bruce Willis and Madeleine Stowe do acceptable jobs bordering on great performances, but just like Looper, there was a standout performance. As I mentioned in my review of What’s Eating Gilbert Grape, I’m a sucker for characters with mental disabilities. Characters like Rodney McKay, Raymond Babbit, and John Nash are some of my favorite characters in film and TV and Jeffrey Goines (Brad Pitt) delivers a stellar performance at the caliber of these characters. Pitt is very deserving of the nomination for Best Supporting Actor but I would also have to agree with Kevin Spacey’s win for The Usual Suspects that year. Very competitive pool of actors in 1995. The art department made sure that the 2035 underground world would only use pre-1996 technology as a means to depict the bleak future. It’s a great idea and in theory it would be a perfect way to depict a future that was forced underground to survive. But the execution was off and as a result, the scenes set in the future were disappointing, especially compared to the rest of the film. All told, 12 Monkeys is another great entry into the time travel arena. Time travel confusion does creep into the story from time to time but the focus rests mainly on the apocalyptic virus and the death of billions of people. It’s an interesting balance between plot and science but I think Terry Gilliam did a great job telling this story.